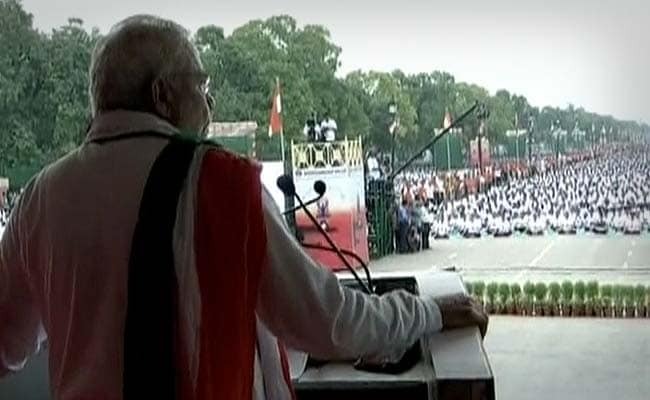 Wearing patriotism around his neck: Is Modi's tricolour scarf justified because he is the PM? Wearing patriotism around the neck: Is Modi’s tricolour scarf justified because he is the PM? In a record-breaking attempt, an estimated 37,000 people took part in a yoga session at Rajpath on the morning of June 21 to mark the International Yoga Day. Among these thousands of people was the supreme encourager of the practice in India, Prime Minister Narendra Modi who said, “Who would have thought that Rajpath would become Yoga Path,” as he joined the record mass demonstration on the first International Yoga Day. Narendra Modi is characteristically an outlandish man. Be it his Republic Day attire that was emblazoned with his name, or his ubiquitous ‘Nehru’ jackets that he has made his own, Modi remains a cult figure when it comes to attires of leaders world over. However, a seemingly somber outfit that our Prime Minister donned today, to mark the International Yoga Day may land him in hot water. Modi was dressed in all-white attire and wore a tricolour scarf. With the recent controversy including complaints against Amitabh Bachchan and Abhishek Bachchan for covering their bodies with the national flag in an ‘insulting’ manner, Modi’s seemingly patriotic attire might not go down too well with the Janata. Many argue that the two are entirely different. While the Bachchans used the entire flag to ‘cover’ themselves, Modi just used it as a piece of clothing to wear around his neck. The question is, how are the two different? According to the prevention of insults to national honor Act, 1971: ‘Whoever in any public place or in any other place within public view burns, mutilates, defaces, defiles, disfigures, destroys, tramples upon or otherwise shows disrespect to or brings into contempt the Indian National Flag — or any part thereof, shall be punished with imprisonment for a term which may extend to three years, or with fine, or with both’. The Act was amended by the NDA government in 2003 and now has an added explanation which reads: ‘The disrespect to the Indian National Flag means and includes using the Indian National Flag as a portion of costume or uniform of any description or embroidering or printing it onto cushions, handkerchiefs, napkins or any dress material’. Thus, for the constitution, there happen to be no demarcations between the two situations. In 2005, BCCI banned India’s boys in blue from sporting the Tricolour on clothing and equipment as it meant showing disrespect to the national flag. Amidst the thousands practising Yoga despite the rains, all that meets the eye is how Modi managed to bring so many people together to indulge in what he feels should be mandatory. Also, the fact that the UN announced an International Day of Yoga last year after PM Modi’s appeal at the General Assembly adds to his achievement. What remains to be seen is whether anyone tries to look beyond the obvious and question the unnoticed mark of patriotism around his neck that isn’t permissible by the Constitution. If Modi’s wearing the Tricolour is justified because he is the Prime Minister and not just another celebrity ‘misusing’ it, then what becomes greatly evident is the hypocritical mindsets of people. The fact that he is the leader is but an added responsibility for him to have kept in mind our legalities. But will Modi’s apparent good ‘intent’ and support base overpower a constitutional provision? If someone is going to stand by ‘piece of clothing around neck’ theory.. You need to realise that it is clearly visible in the photos that the scarf touches his feet and ground mang times.. – clearly more disrespectful than what amitabh bacchan did..
People can argue that it is not a flag as the ashoka chakra isn’t visible.. Remebeer the movie Dirty Politics? Malika Sherawat got an FIR against her.. In her picture too there was no ashoka chakra.. Just the three colours..
Basically it is an issue only when Amitabh Bacchan or Malika or common man does it.. Honourable PMji doing it is fine.. Had it been any of the Gandhis or a muslim leader wearing that scarf, there would be demands for their arrest by now.. So it is clear that using Indian National Flag as drapery in itself is a way how one can insult Indian National Flag. its very disgusting how modi bhakts are giving explanations and tryin to justify that what he did with our flag is right …..
he has tied our flag with his leg…. Now where is the media ? y this is not shown on any news channel ? all are sold outs ! all these things are for normal people … its atleast good to c that he only wiped his face not his ****. First of all why Tri colour why not other coloured scarf? In abroad they take pride by hoisting country’s National Flag before the house on the Birthday of the owner of the House(Denmark). Once somebody in Denmark was bringing down the National Flag in the evening and he missed it and the Flag touched the ground. An Old Woman passing by car,stopped and reached the spot crying and asked the Flag should be lifted up immediately. Such is the respect they give to National Flag. A Controversy ridden TRP hungry Media and several of my fellow jobless citizens are ready to ‘tri’vialize anything and boom…! a new controversy is born! Cricketers and sportsmen wear uniforms with streaks of tricolor and they rub the dirt on their faces, sweat and snot and what not on their clothes while at play… now go ahead and cry foul for that too!. Congress has the tri-color in their flag and they have looted the nation way too long..and tainted the tri-color. so maybe they should stop using the tri-color! Or simply lighten up and pick a cue from Modi’s style and bring tricolor into your everyday life.